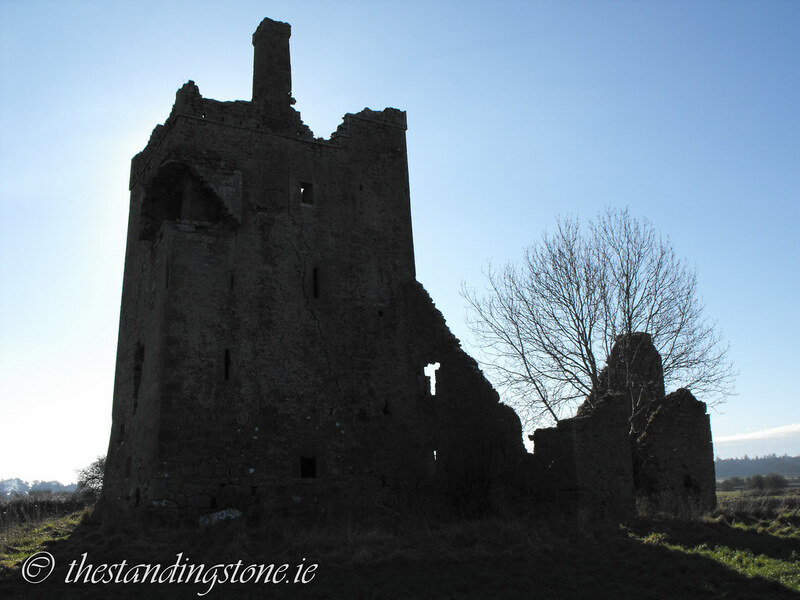 The Standing Stone: Srah Castle and Bullaun Stone, Ballydrohid, Co. Offaly. 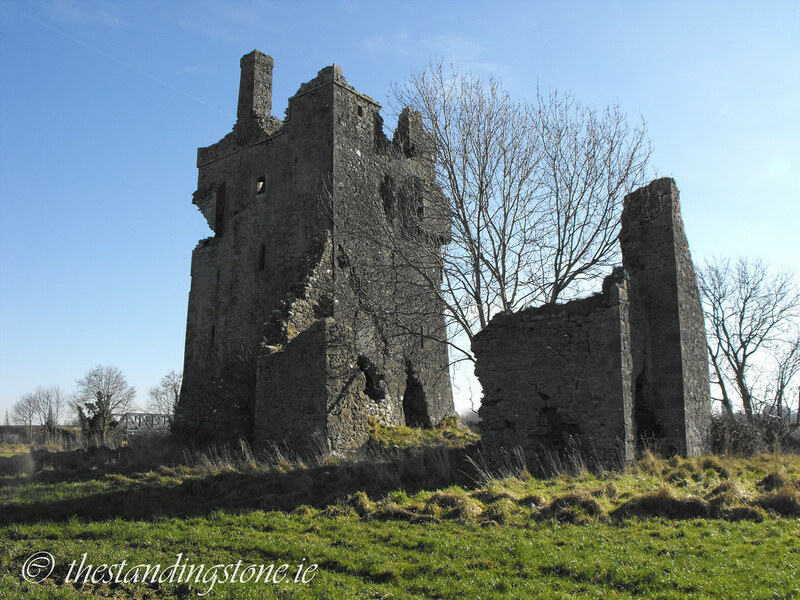 Srah Castle and Bullaun Stone, Ballydrohid, Co. Offaly. 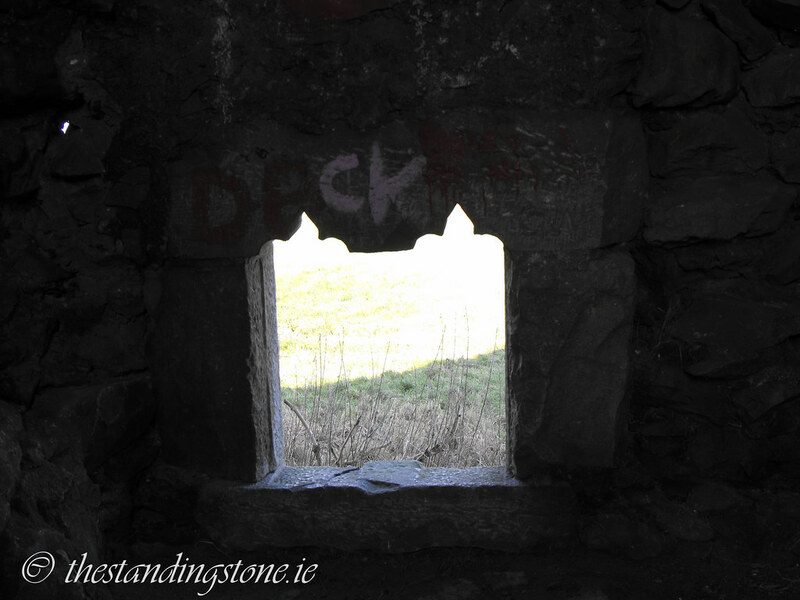 Location – Just outside Tullamore town on the banks of the Grand Canal and next to the railway line. It is accessible from the R443 on the N side of the canal down the road that runs along it. 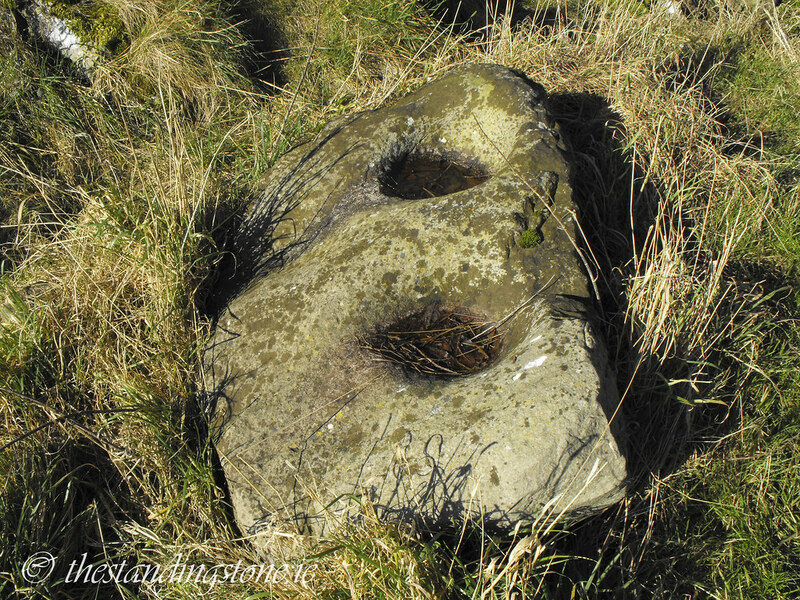 Description and History – This site intrigues me somewhat because of the bullaun stone, assuming that it what it is. 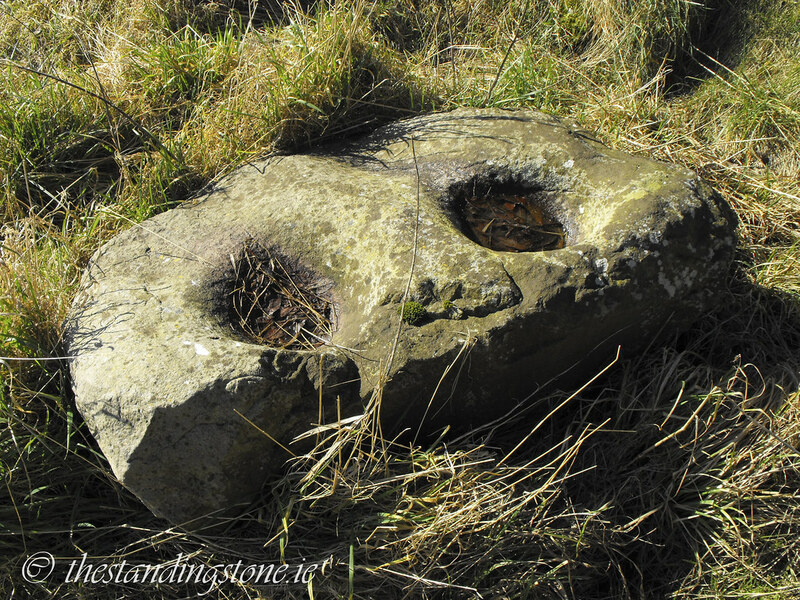 The bullaun is not mentioned in the Archaeological Inventory for County Offaly and I can’t find mention of it anywhere so either it’s not a bullaun or I’m the first one to spot it. Look at the picture below and you will see that it looks like a bullaun. The reason for its being here is puzzling. The nearest ecclesiastical site of only about 2m away so it is possible that it was brought from there. Whatever the reason it is interesting and makes this site special. 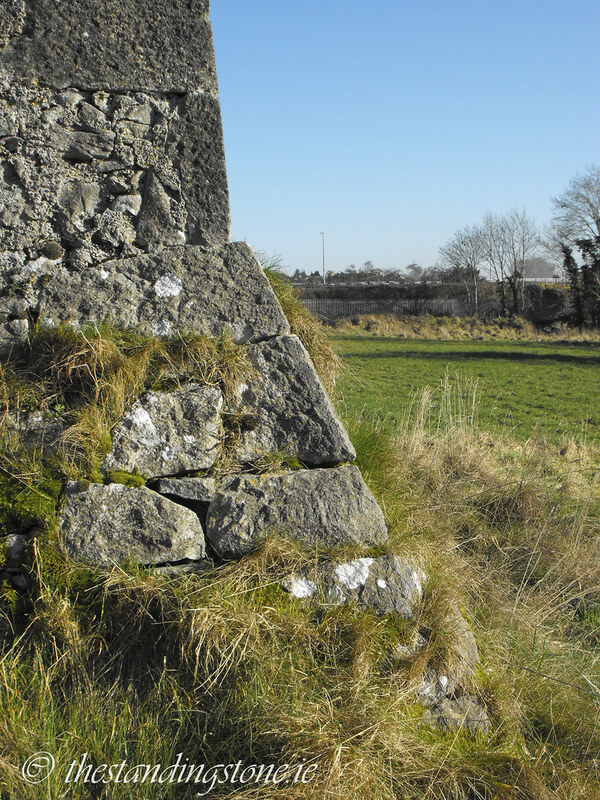 However, the location of this site so close to Tullamore is a letdown. The interior of the site is littered with broken glass and beer cans. There is also a lot of graffiti both inside and out. 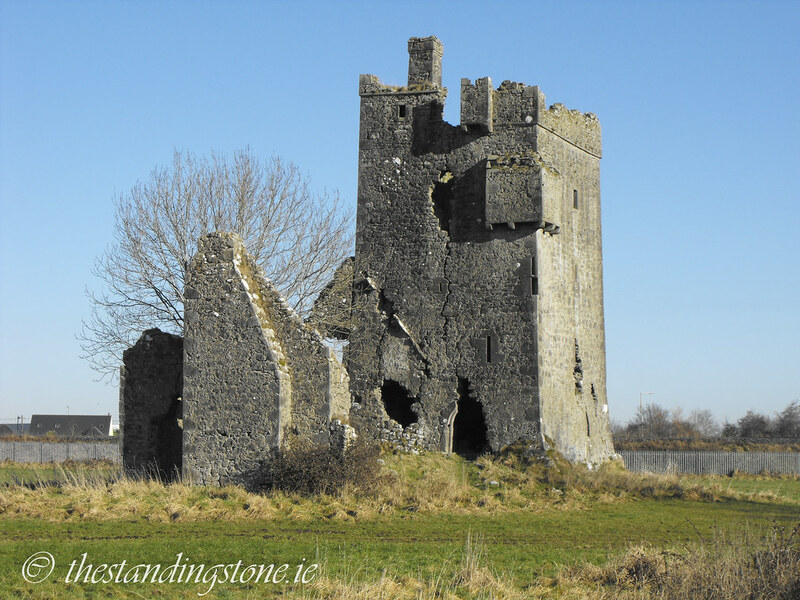 Its location right next to a modern housing estate and a railway line really emphasise that this castle had now been lost in time. 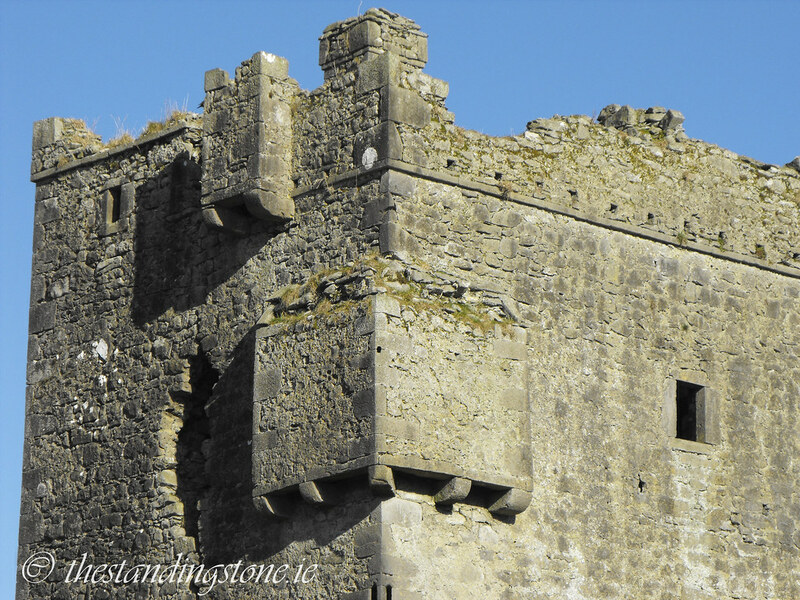 The world has moved on and the castle is slowly crumbling away as time passes. 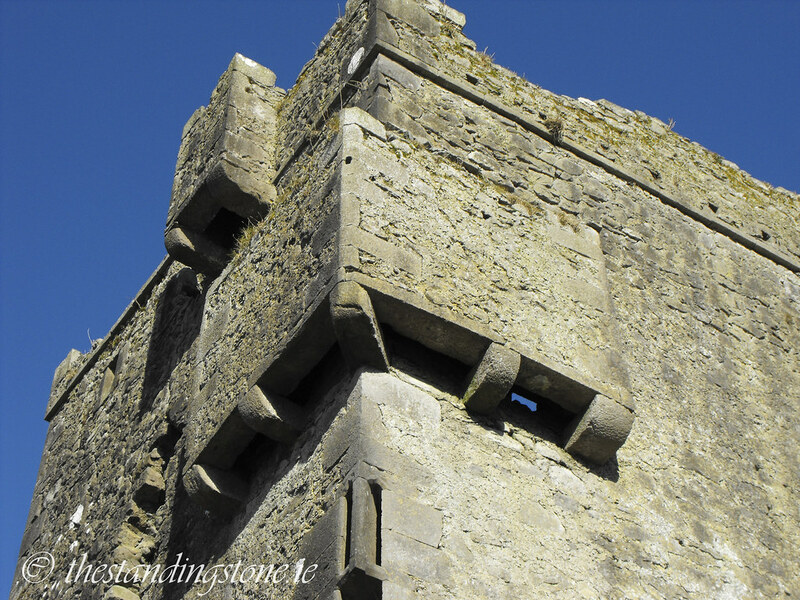 The castle was built in 1588 by John Briscoe of Crofton Hall, Cumberland. It was four storeys high and measures about 7.5m x 9.8m. It is about 20m high. This castle is highly defended and has a prominent base batter, two bartizans (one is now destroyed), machicolation and many gun loops. 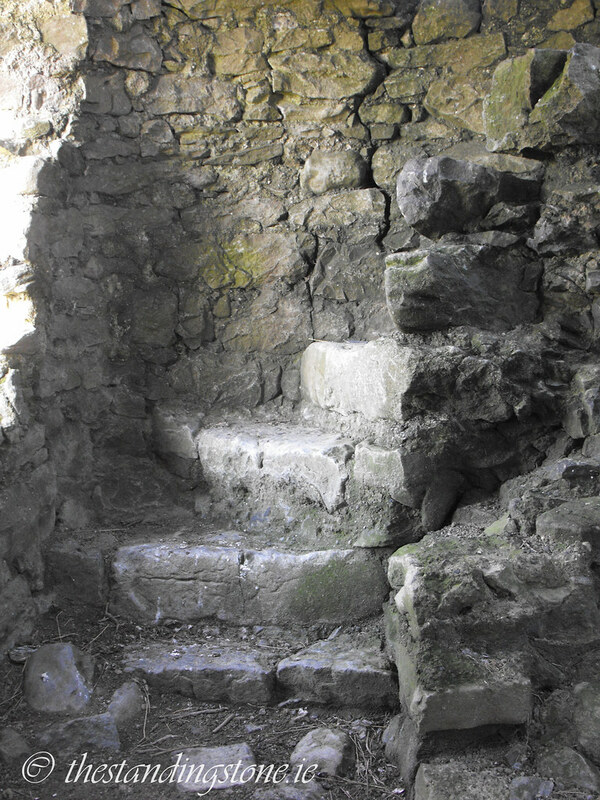 The spiral stairs is now destroyed with only about ten steps at ground level. 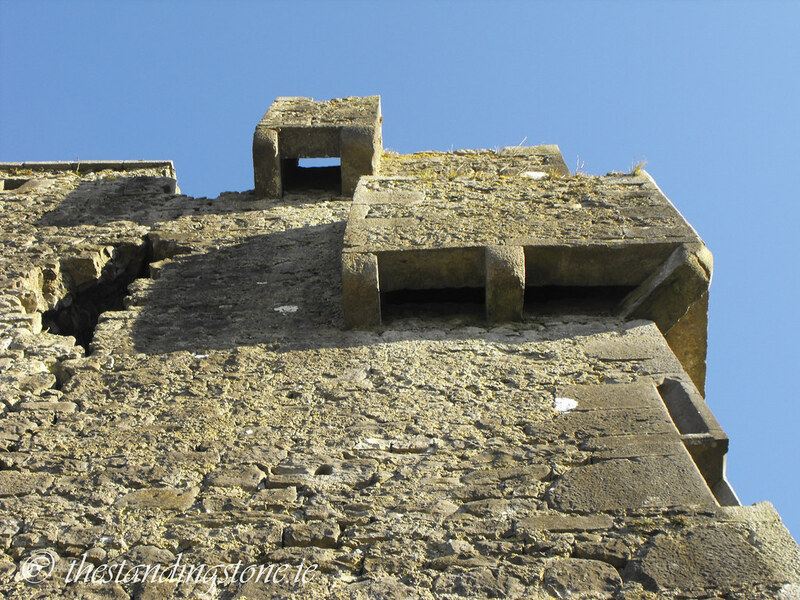 They are still in place above the third story but these cannot be accessed. 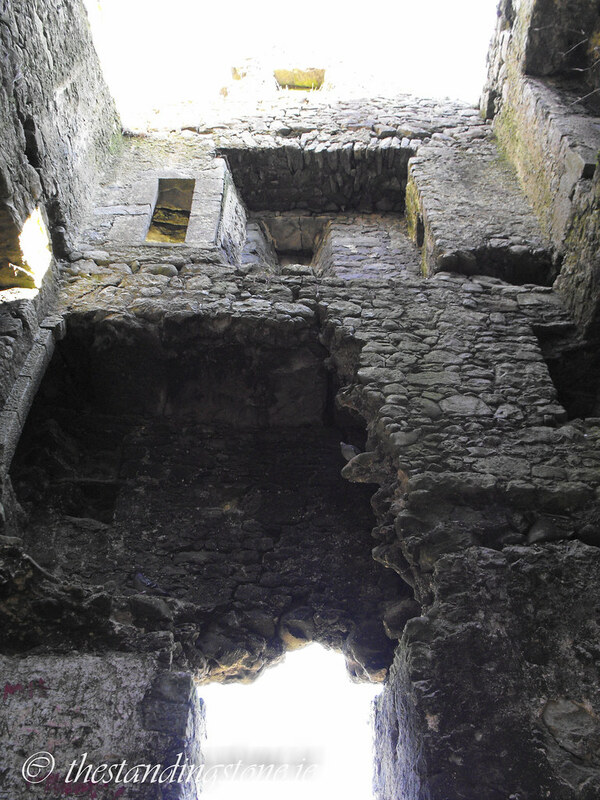 Partial remains of doorways survive on the spiral staircase which would have led into the now missing rooms. Inaccessible mural chambers survive on every floor and a fireplace and garderobe can still be seen. 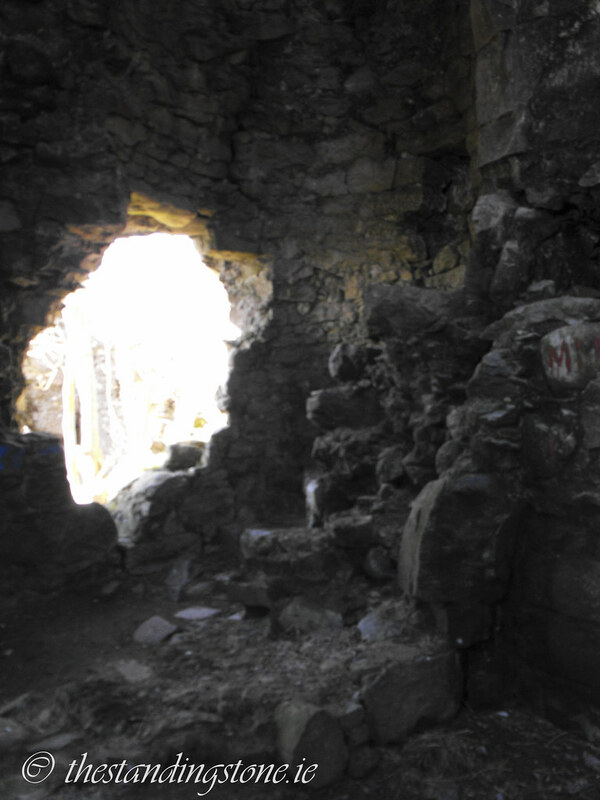 The beginnings of a barrel vault in the second floor can still be seen. 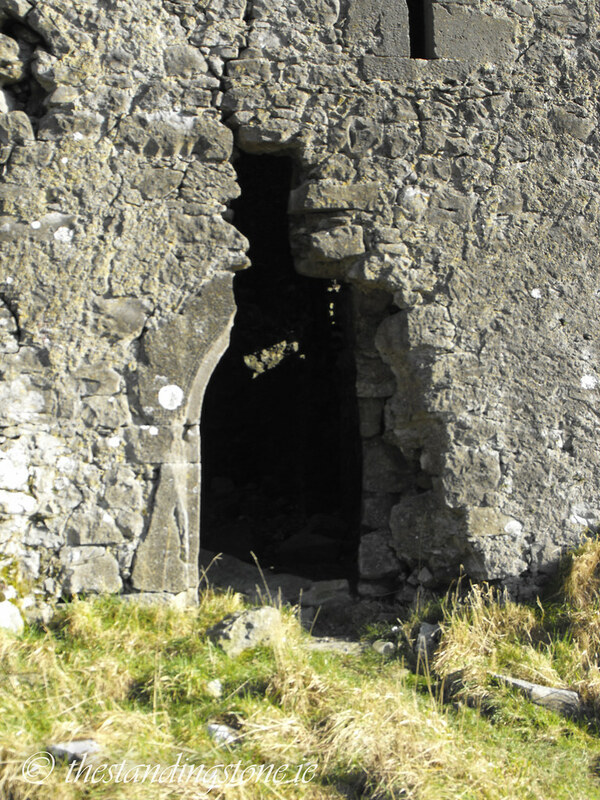 The entrance to the castle is on the W wall. 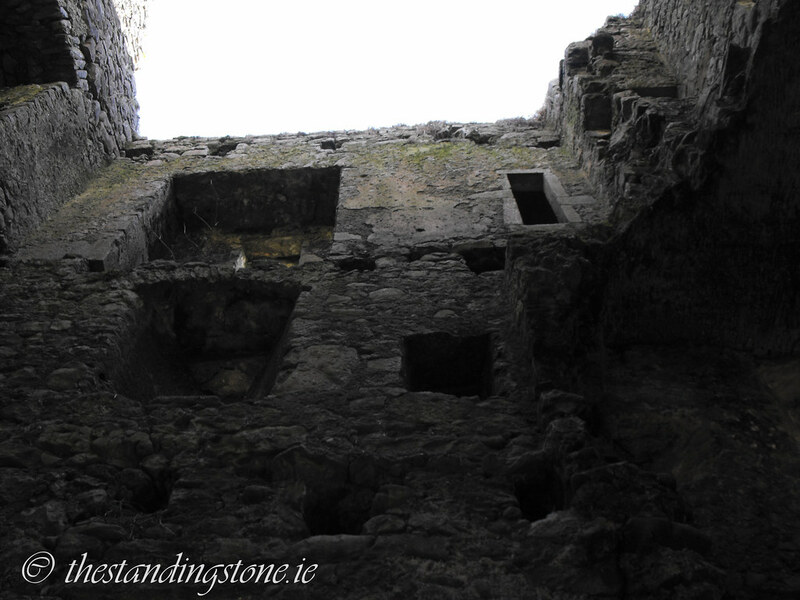 Also on the W wall are the remains of a later house that was built onto the side of the castle. 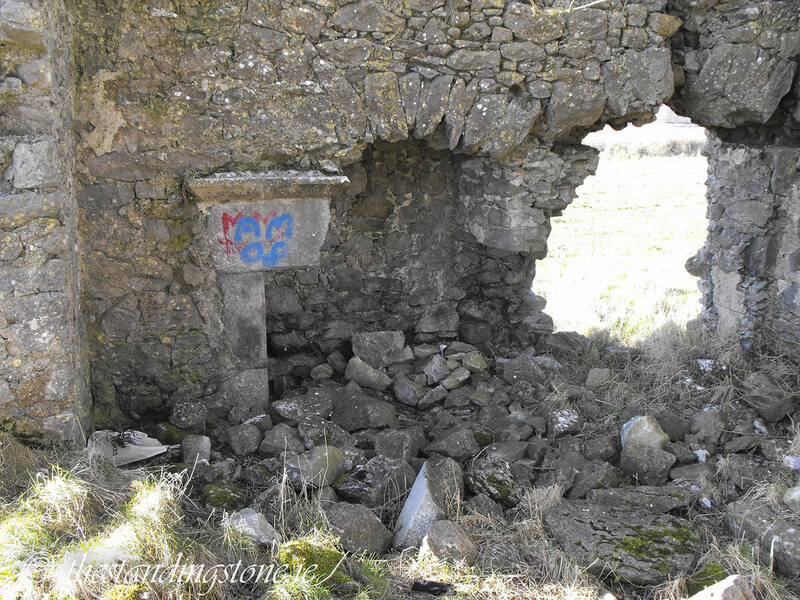 A fireplace still survives in this later house – although there is some spray paint on it now. The bullaun is about 1.5m long and has two large depressions in it. 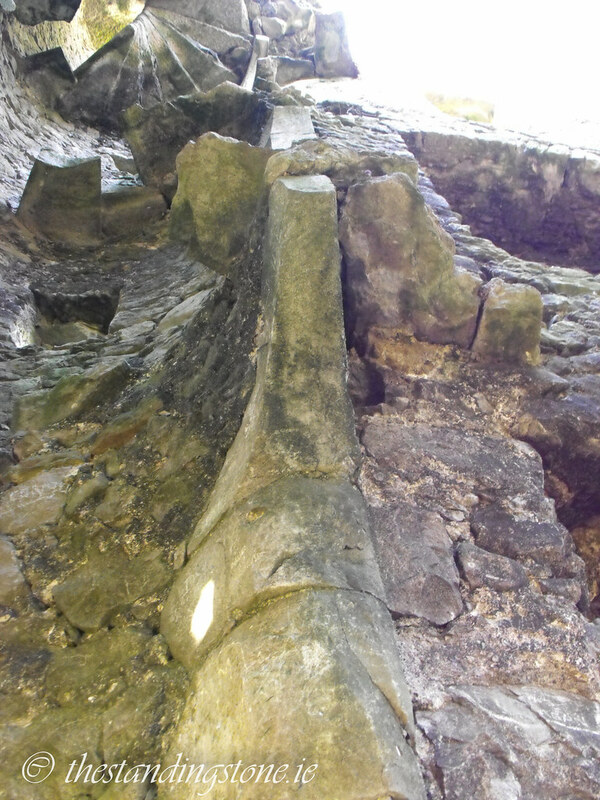 It is located near the W wall of the castle next to the remains of the later house. Difficulty – Easy to find along the canal but you have to duck under some barbed wire to get access to the field so be careful. Also there is a lot of broken glass and litter at the site. This may not be a site to take small children to. For more bullaun stones, click here. The castle as viewed from the canal. Note the missing bartizan in this shot. Fireplace in the attached house. It is a shame about the graffiti. 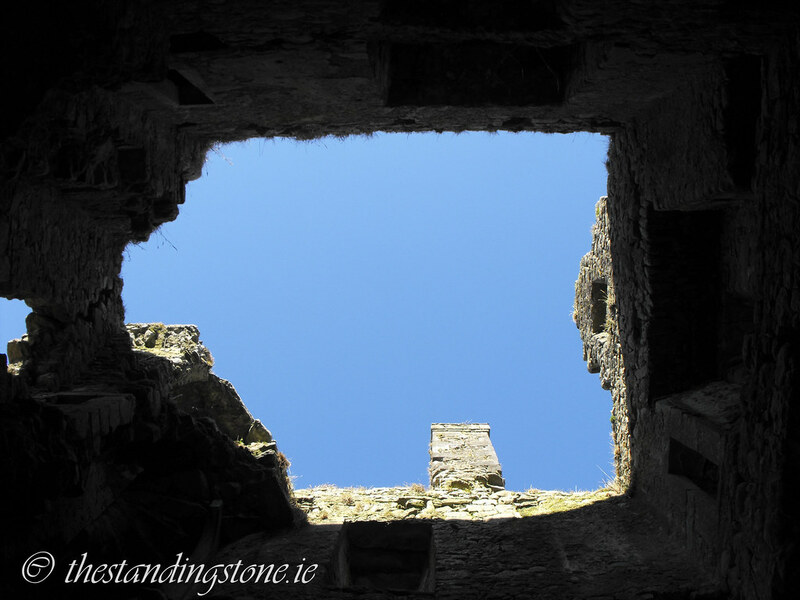 Stood in the castle looking up. Gun loops from the inside. 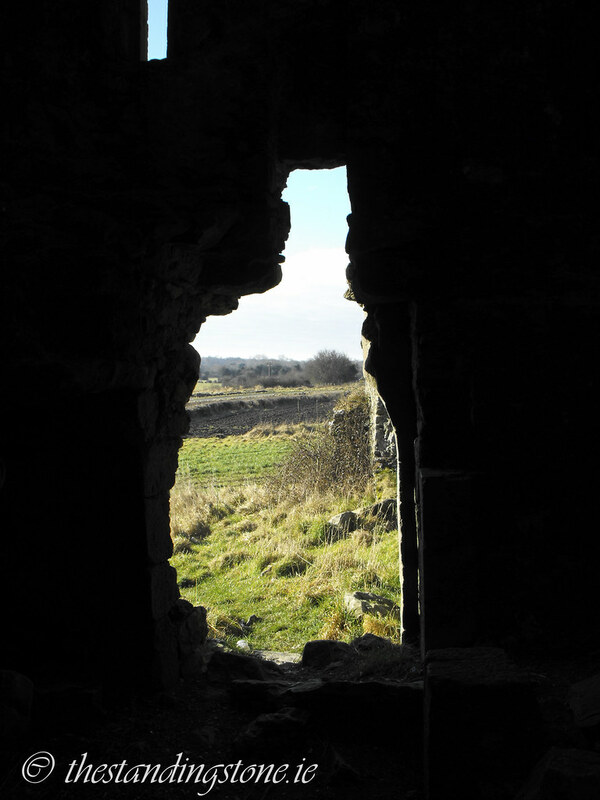 Looking out of the doorway. 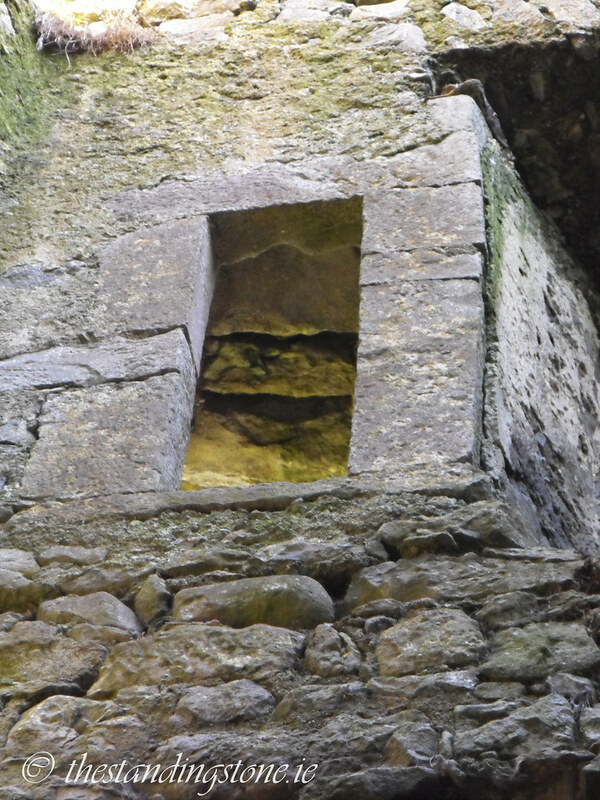 This window is later to the castle and does not match the narrow slits elsewhere. I can only assume this was added in less threatening times. It looks as if it might have been quite nice but the graffiti really detracts from it. 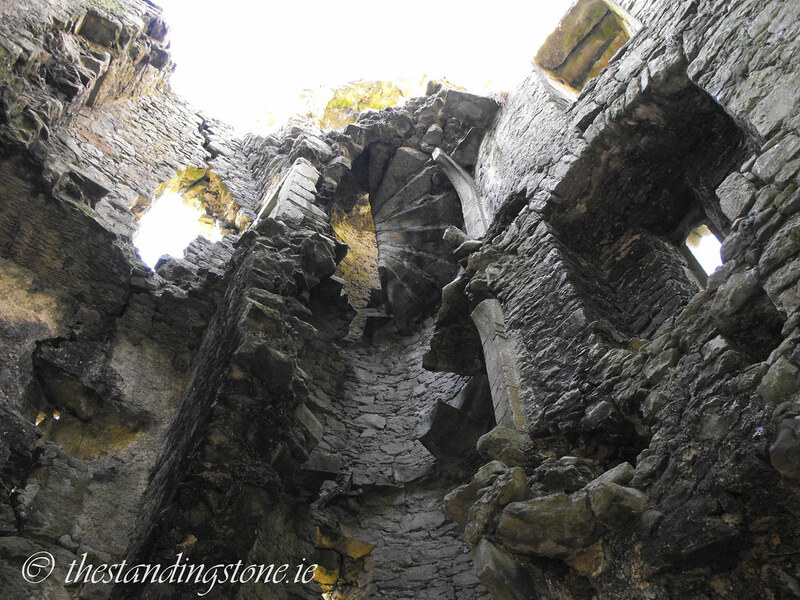 You can see that the spiral stairs survive further up the structure. Even if I could get up there I wouldn't trust them. 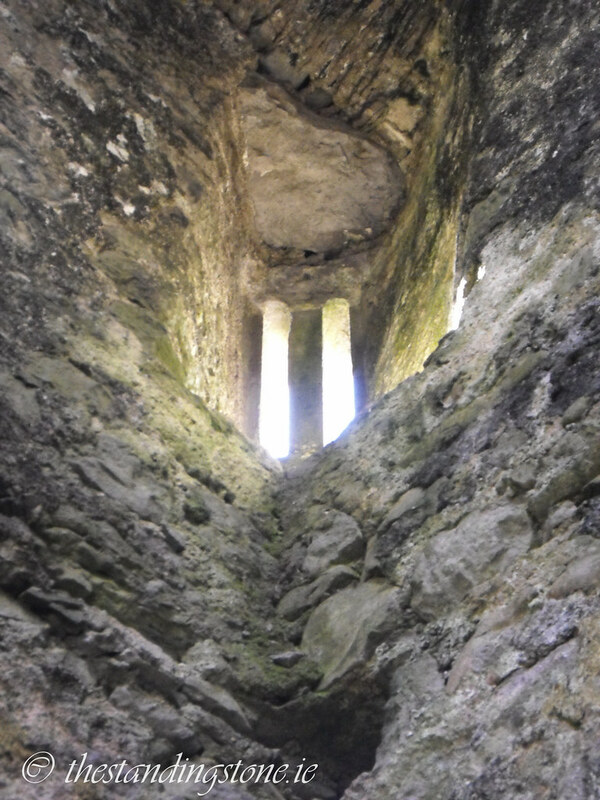 The remains of the spiral stairs at the bottom. Hello. The date 1588 taken from a now missing datestone, which commemorated the John Brisco, and his wife Elizabeth Kearney. These are now generally regarded as 'stones with dates' and seem to date themselves and little more. 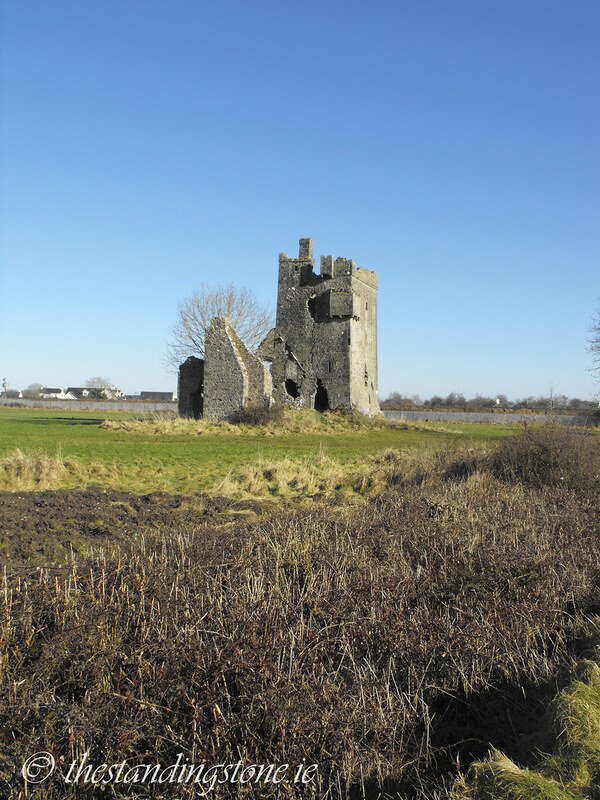 A ruined castle is noted at Ballydroichid in the 1550 Cowley Survey of Offaly. Dr. James Lyttleton informed me that the stairs was demolished by Offaly County Council in the early 1980's for what now would be euphemistically called 'Health & Safety Reasons'. Love your site and particularily your great photos. Thank you for the information. 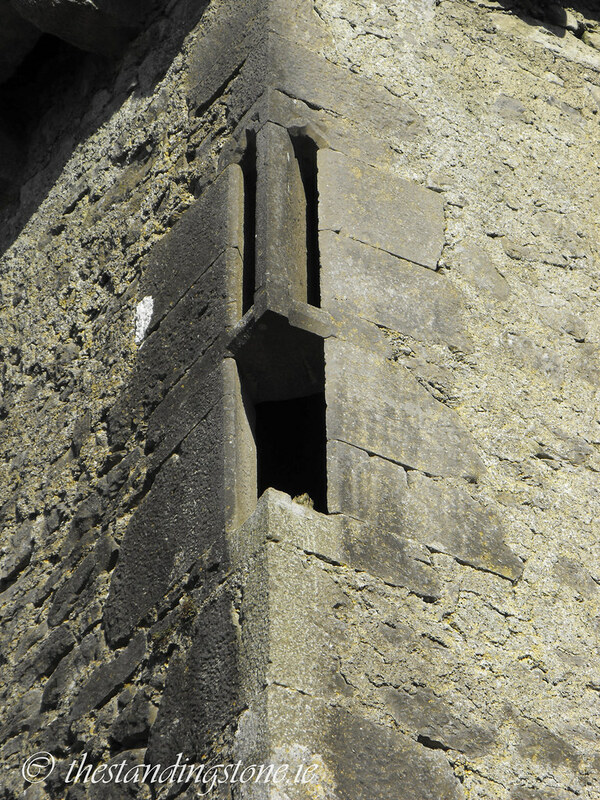 I've heard of Offaly council doing that in many castles. Nothing short of vandalism, well 'official' vandalism. 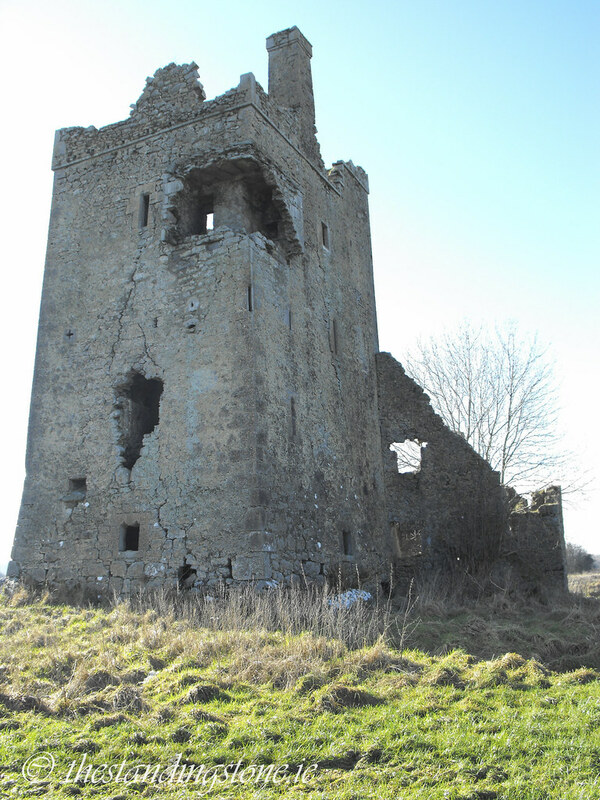 The ruined castle at Ballydrohid of 1550 may have been a Dempsey castle, as Owen McHugh had a lease on land just south of the present Charleville House, the castle site now subsumed under sheds belonging to the estate. Bishop Edmund O'Dempsey held a meeting of the Confederate Catholics here in the 1650s. A group of local lads climbed the existing stairs before it collapsed and had to be rescued by the fire brigade. 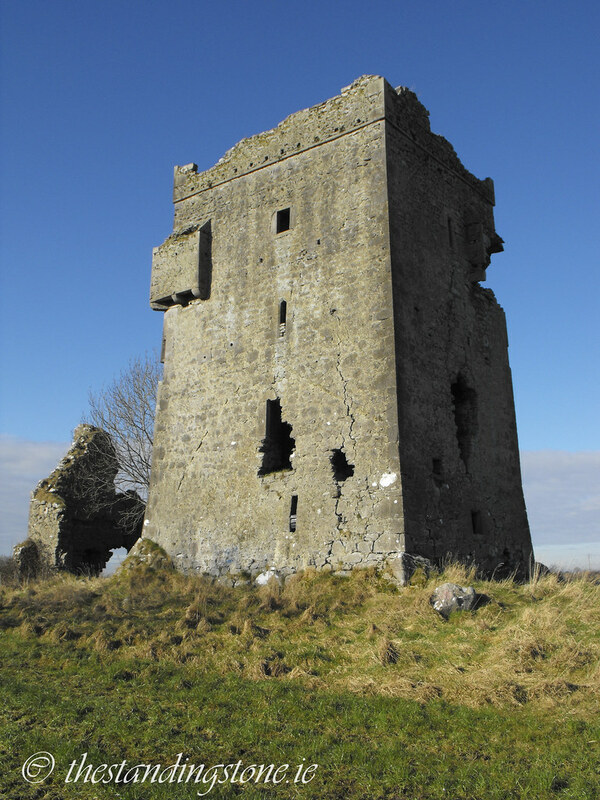 The army were the called in to bring down the castle, explosive were placed deep in the foundations and then bang. 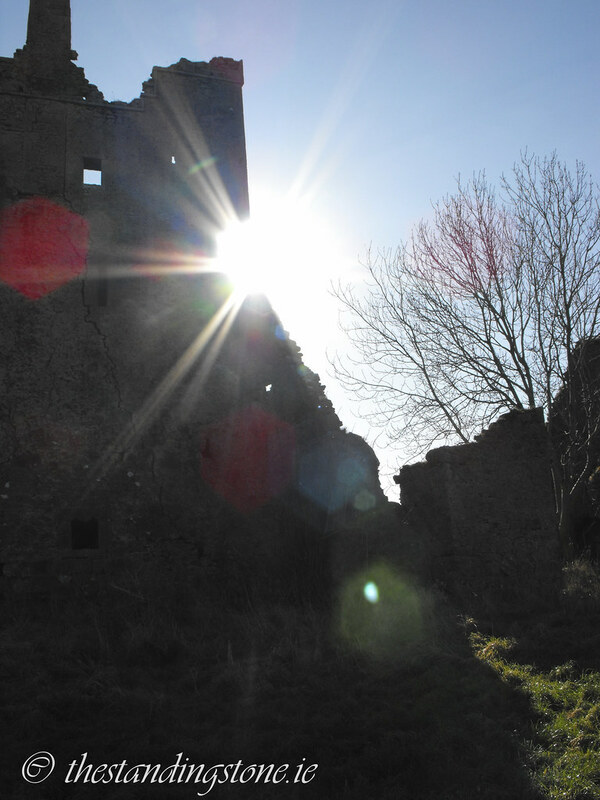 The castle still stands. This happenedid to late sixties.